2019 - Year of the rupee? Very well could be, as Reuters survey indicate that investors are turning bullish on Indian rupee ahead of the general election, set to begin in April. Indian general election is the biggest and longest in the world. The polling process would last more than a month as almost 800 million people or about 10 percent of the global population would cast their ballots. First polling begins on 11th April and the result would be announced on May 23rd. Investors are betting that despite recent setbacks in regional election0, the current Bharatiya Janata Party (BJP) led by Prime Minister Narendra Modi would return to power. Recent positive economic releases also keeping the INR well-bid against the USD and that at a time, when USD remains well-bid against its major trading counterparts. Recent PMI reports indicated that both India’s services and manufacturing sectors are expanding. Moreover, lower oil price also remains supportive to INR. As the tense situation somewhat settled down with outpouring International support for India, rupee cleared a hurdle. 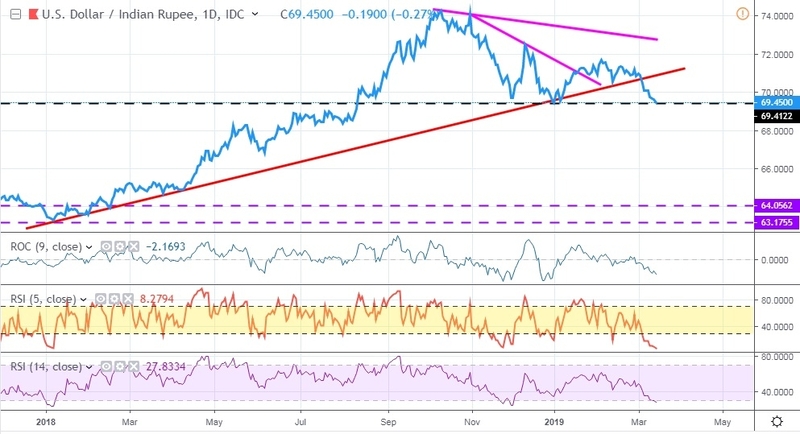 USD/INR broke below the rising trend line that has been in place since the beginning of 2018.